Initial reviews on Rock Star Ate My Hamster were divided, but it seemed to become some sort of a cult hit. Currently, the C64 version has a score of 7.5 from 50 votes at Lemon64; the Spectrum version has a slightly higher score of 7.87 from 56 votes at the World of Spectrum website; the Amiga version has a 7.63 from 51 votes at LemonAmiga; the Atari ST/STe version has a whopping 8.5 from a total of FOUR votes at Atarimania (come now, it isn't that hard to vote, is it? ), and from the official versions, the final score is for the Amstrad CPC at CPC Game Reviews, who have given it an amazing 9 out of 10. The unofficial Plus/4 version has been voted 5 times at Plus/4 World, and currently has a score of 8 out of 10. I wouldn't call any of that exactly horrible, but the big question is... as it is a management game, how different can it be on all these computers? Your mission in the game is to manage anything from one to four stars simultaneously, which are caricatures based on real-life rock and popstars, such as Madonna, Lemmy, Michael Jackson, Freddie Mercury, Cyndi Lauper and Elton John. All of the stars come with their own weekly price, and so you will need to be as quick as possible with coaching them into properly sellable artists. You need to write songs, release singles, videos and albums, along with doing publicity stunts and touring different sorts of venues. The game's ultimate goal is to get four gold records within a year, and we all know how impossible that can be, right? As the saying goes, touring can make you crazy (no copyright infringement intended), and so your stars have a tendency to make you bankrupt in no time, so you really need to think your strategies carefully. Although Rock Star Ate My Hamster can be aggravatingly random in its turn of events, there is a certain truth to the whole parodic representation of the music business, and as such, makes you all the more addicted to the game. A modern gaming audience might not relate to it all that well, because of the heavily 70's/80's based artist library, but I do think today's young gamers need this kind of a game featuring caricatures of today's artists. Another game primarily released in disk format. You need to be loading random data based on your actions constantly, which makes the tape versions seem useless, but they do exist. However, since the floppy disk is the more natural media for this game to be in, I will not do any comparing for this section. Almost the whole game is played using command menus, which are navigated with a joystick, a mouse or a keyboard. The only bits where you MIGHT need your more than three keys from your keyboard are naming your band and naming new songs and albums, and striking your keyboard with your fist when you are suddenly bankrupt for the Nth time and you just can't take it anymore, and your frustration has built up so much you're soon going to need another computer. Joking aside, there's not really much more to the game than that. The only thing you need to learn is the strategy of winning the game, which is basically the same in every version. Therefore, the only two things that actually have any effect on the playability are the loading times and the entertainment value each version gives, which is mostly dependent on each individual's musical education and ability to appreciate musical, as well as situational humour. 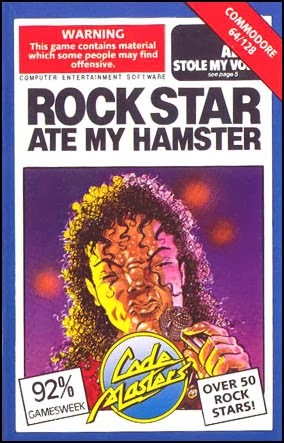 That said, Rock Star Ate My Hamster is not a very playable game as such, precisely because of the mostly random way of things to happen - particularly the bad things. So, for the first time, no score will be given for this particular section. Every version shall be considered equal in this particular way. To deviate from my own norm, I will include the loading screens here this time, because it's the only place where the game's title is shown in its entirety on the 16-bits, and the only place where the game's title is shown at all. For the Amiga and ST, you get more of an opening sequence with credits and all. I'm not entirely sure, which stars are the caricatures supposed to represent here, but I'm guessing they are, in order of appearance: Michael Jackson, Morrissey, Tina Turner and Phil Collins. Each page of the sequence features more than two bits of texts, so naturally, you won't be seeing all of them here. But, essentially, what you can gather from this comparison of screenshots already is that the 16-bit versions only seem to differ in the brightness of the palette, and even that might be due to the emulator settings. So, I will not be including the Atari ST screens from now on. Loading screens. Left: Commodore 64. Center: Amstrad CPC. Right: ZX Spectrum. The title screen on the Spectrum shows the complete credits only after the game has loaded, in a really fast scroller at the top of the screen, but don't you think that's a rather brilliant pixelation of Lemmy? The loader screens on the Amstrad and C64 only seem to have stretched-out versions of the same mugshots of Michael Jackson, Stevie Wonder, George Michael and Madonna, as are shown in the game, only in full colour and more blocky. Also, this is where all the credits that need to be mentioned, have been mentioned. It's not much, but it's there. Starting the game at Cecil's agency. Left to right: Commodore 64, Amstrad CPC, ZX Spectrum, Commodore Amiga/Atari ST.
You start at the Cecil Pitt Theatrical Agency's office room, which looks to be in bad condition, and if the 8-bit versions are to be believed, entirely too barren to be considered inhabiting people who would be even remotely capable of handling business. The 16-bits, at least, a door, a filing cabinet, and a poster on the wall. On the Spectrum and Amstrad versions, Cecil is so poor, he can't even afford to keep his cigar lit. Strangely, the C64 and Amstrad versions seem to have the most tight contest on which version has the most colour on screen. The C64 version's colouring method seems to have been derived more from the Spectrum version, due to the blocky colouring errors around Cecil's shoulders and the telephone, so I'm actually already inclined to think that the Amstrad version looks the best. However, Cecil and Clive have some colour on their skin on the C64 version, so that's a bonus. One strange thing worth noting is the speech bubble on the 16-bit version, which is pointing at Cecil at the beginning - all the others point at Clive, which is strange, because Cecil has the first bit of dialogue in the game. A similar lack of graphical detail and colour is very much apparent in this lot as well. Curiously, though, the Amstrad's record awards are now blue instead of red, and it's the only screen where it is so. Naturally, the 16-bit versions have more colour, more detail and more humour. I know this will seem a bit strange, but I think the advertisement posters on the C64 and Spectrum look the best - at least, the least clip-artsy, mainly due to the colour choices. The more colourful ones just look a bit too "Microsoft Paint picture by a 5-year-old" in style. Somehow, I'm starting to believe that the 16-bit versions were the original development platforms, but I can't say for sure, because no confirming information has been found so far. The graphics are the main thing to suggest so, because the amount of colour and detail are so well thought out on the 16-bits, and so very lacking in contrast on the 8-bits, that I can't help but to think so. Look at the bus interior, for example. On the 16-bits, there is a good sense of realism, depth and attention to detail in all its cartoonishness, that makes you wonder at least, had the graphicians of the Spectrum version never been inside a bus, to leave no room for walking between the seats? When you pay attention to more details on the Amiga/ST version, the black-and-white seats start to look more like radiators compared to the red leathery seats that manage to look almost inviting, and then the radiators have no legs. Perhaps I'm just too picky about certain things? There is not too much to say about this particular bit, other than the obvious. All the 8-bits look same enough to me. The 16-bit's "The Stun" logo looks the closest to the original "The Sun" logo, and the rock star picture has some colour as well - as is expected. Again, the amount of detail on the 16-bit versions is just sublime in comparison to the 8-bits, but all the 8-bit versions do their job well enough. And again, Amstrad's lack of blocky colour problems is more pleasing to the eye. Finally, the least graphical section of the game - the charts. Of course, the 16-bits have more stylish text, numbers and chart progression markings, but I can't help but like the C64 and Spectrum's nicely colour-separated artist names and song/album titles. It doesn't help much, really, since it's a very minor part of the game. All in all, the results for graphics are pretty obvious, and rather surprisingly, the Amstrad version is going strong with this one. Because this is a game with a heavily music-based theme, it's all the more important that the music actually represents the humour this game is trying to convey. Therefore, I think it's all the more proper that the AMIGA version should have a sleazy jazz theme tune in the intro, instead of a generic electronic rock tune. As was the case with the previous game comparison, the ATARI version seemed to have a slightly worse overall sound quality than the Amiga version, but the style is very similar, except that it has a more generic-sounding theme tune to go with the rest of the game's music. All the 8-bit soundtracks sort of mirror the same idea behind the 16-bit soundtracks, but somehow they all feel a bit uncomfortable. On SPECTRUM, the tunes made by your rockstar(s) don't start off nearly as bad-sounding as the ones on the 16-bit versions or the COMMODORE 64, but I suppose that's due to the memory restrictions. Curiously, though, in the AMSTRAD version, the tunes made by your rockstar(s) have a tendency to be ultra-fast, so it's difficult to hear every detail from them. Taking time in the rehearsal studio doesn't really affect the artists' abilities as much, at least sound-wise, but it might help build you some audience. Also worth noting is that the Amstrad and Spectrum theme songs are the same (although perhaps the Amstrad version sounds better, at least to my ears), and the C64 version has only a very brief and completely different intro melody when the game starts. A thing that's quite unusual for any game at all: Rock Star Ate My Hamster has very little sound effects. You can actually count them with one hand's fingers - even on the AMIGA, which has the most sound effects of all the versions: telephone ringing, talk-babble, applause and booing, three of which are samples. So you might guess already that the ATARI has less sound effects, but then all the 8-bits have the same effects as the Atari does, which I'm guessing is a rather unique occurence. As it is a very musical game, the little tunes themselves act as sound effects of sorts. For this reason, it's a bit difficult to separate the two elements from one another, and so I have to organise this top sounds chart by counting the overall amount of sounds along with the quality. It's another unfair situation, basically due to the 16-bit vs. 8-bit battle. Once you take the 16-bits out from the count, it gets more interesting, but only slightly, because then it becomes a disk vs. tape battle. Even then, the differences are so insignificant, that you really need to concentrate on minute details if you want to decide which version you would rather play. I love the loading screen on the Spectrum version the most, but I think the Amstrad's graphics are the best ones from the 8-bit versions. Still, the tunes sound better on the Spectrum, but they sound even better on the C64. Every version is a compromise, so choose what you like - you can't really go wrong, unless you really hate this game. The final scores seem rather useless to even count, so I shall just make an estimation this time. If you ever wondered about all the caricatures in the game, take a look at the list down this page. It features downloads of the unofficial Plus/4 conversion as well as some other potentially useful information. As you might have noticed, I didn't include the Plus/4 version in the mix, but that is mostly because I only got it working after I had written this whole thing. So, I might as well give you a short rundown of it now. Screenshots from the Commodore Plus/4 version. So, this version is spread around as "Rockstar Manager", most likely to avoid any legal problems. The playability on the Plus/4 is a bit slower than on the other 8-bits; the graphics are similar to the C64 and Spectrum versions (although a bit darker), but the colour clash problem is more pronounced; and the sounds are surprisingly faithful to the original idea behind bad performance before rehearsing long enough, but the basic sound set is irritiatingly tinny and has no drums. It easily sounds the most awful of the lot, and even using a SID Card helps none at all. So, all of that pretty much places it in the last place, below the three other 8-bits. That said, considering the Plus/4's capabilities and my previous experiences with the machine, it's a relatively good conversion. Well, that's it for now, hope you liked it. Perhaps next time, I'll be posting something more worthwhile. Comments, suggestions and corrections are supposedly on the bus.